UPDATE: 'Snappy-Brown' fuel with absolutely no moisture made firefighting conditions tough for emergency services at Grantham, yesterday. 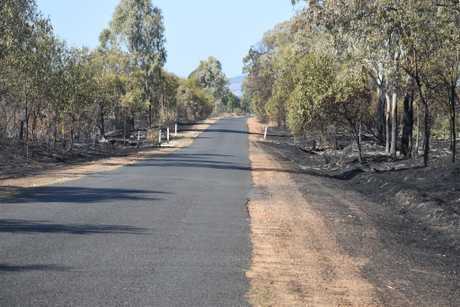 With minimal wind and humidity, QFES area director for West Moreton Peter Roberts said it was the fuel itself that drove the Philps road fire and escalated its intensity. The blaze was mostly contained to one property, but did cross the Warrego Highway, which Mr Roberts said was brought under control quickly. It also impacted the Queensland Railway corridor, but Mr Roberts said there was no requirement to stop rail transport. He said QFES continued to investigate the cause of the fire, but it was believed to be started by a welder on the property. "The dryness of the fuel at the moment is probably as close to record of how dry it really can be," Mr Roberts said. "There is no moisture in the soil (or fuel) at all … that fuel is just ready to go with any ignition source whatsoever." A total of 21 firefighting appliances, six command vehicles and two aircraft battled the blaze, which was brought under control late Thursday evening. 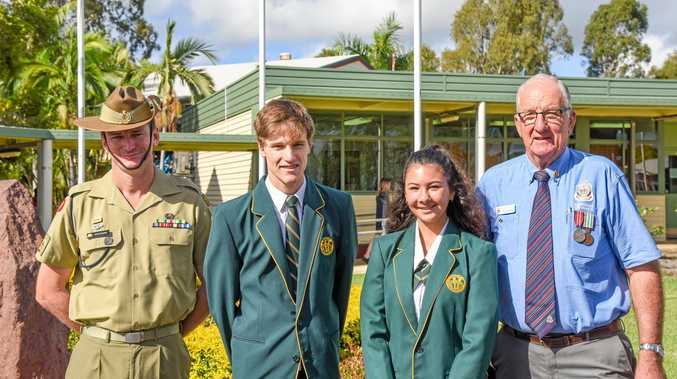 Mr Roberts commended the efforts of paid and volunteer firefighters. "They did some brilliant work out there, they fought very hard and very long," he said. But with much of the state and nation impacted by the drought, Mr Roberts said it was shaping up to be a particularly volatile season. "All these elements (fuel loads, moisture, humidity) go into the mix to create a more dangerous season compared to ones we've seen in the past," he said. He urged all residents living in or alongside rural areas to have a bushfire plan ready. "As many firefighters as we have, we do not have one for each house," he said. "It is absolutely imperative that people have a plan in place and know what they are going to do in case of a bushfire coming through." EARLIER 7am: Firefighters will return to the site of the Grantham blaze this morning to ensure the fire has not jumped containment lines. At about 10.30pm last night (Thursday) the fire was under control and was burning within containment lines, a Queensland Fire and Emergency Services spokesperson said. It was downgraded from a watch-and-act message to an alert. 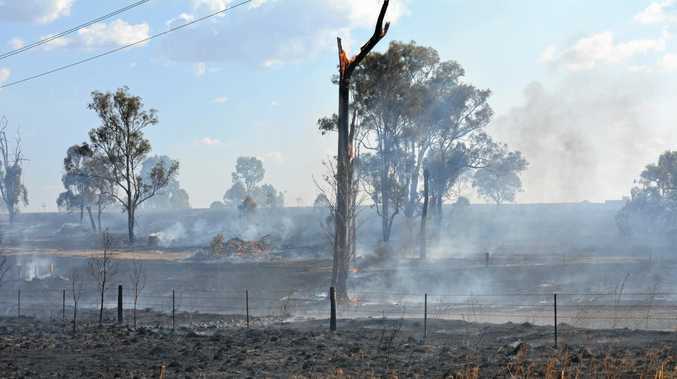 The spokesperson said for a short time, the grass fire, which burnt through 123 hectares, the equivalent of 123 rugby fields, did cross the Warrego Highway. Crews managed to prevent the fire spreading through back-burning operations and aerial water bombing support. Crews also performed back-burning operations along the Warrego Hwy. The fire originated at Philps Rd, Grantham, and no buildings or structures were damaged. The Warrego Hwy has been re-opened.